The final day of the 2015 International Space Station (ISS) Research and Development conference closed the event with multiple talks looking at exploration beyond low-Earth orbit (LEO) and novel ways the space station is affecting life on Earth. Panel sessions began with a talk about the commercial capabilities and technologies that will be needed—together with international collaboration and new relationships between government, constituents such as international consortia, and industry partners—in order to successfully address the challenges and promise of deep space exploration. NASA Deputy Administrator Dava Newman, along with NASA’s Chief Scientist Ellen Stofan and Chief Technologist David Miller, presented as the group explored key questions associated with international and commercial partnerships in support of exploration beyond LEO. Additional panels included discussions about materials science testing and manufacturing in space, how the ISS National Lab is influencing students and educators in the area of science, technology, education, and mathematics (STEM), and the challenges for the journey to Mars —getting there (and back) and developing the technology necessary to keep human astronauts alive, thriving, and productive for the 1,000 days such a mission will require. A series of technical breakout sessions also took place, focusing on space biology tools, cell and microbiology in space, materials manufacturing and function in space, STEM programs and processes and concepts for the future. 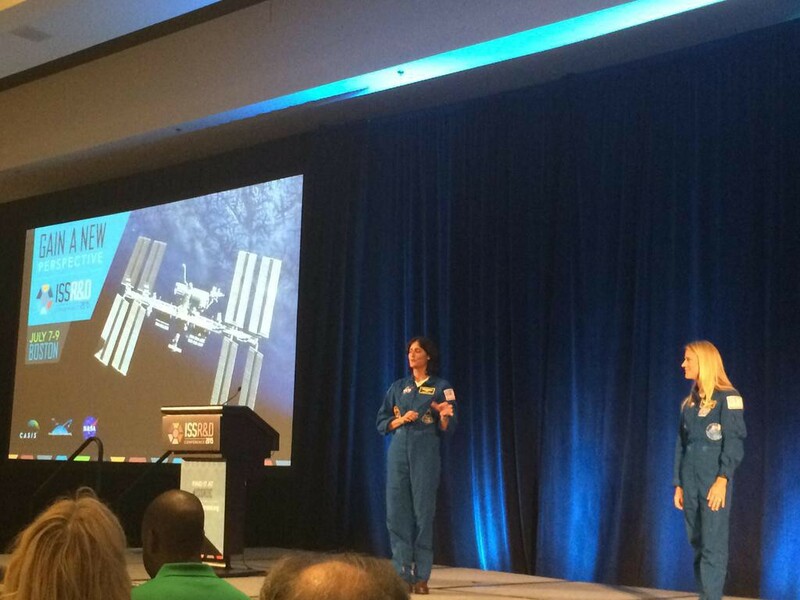 Astronauts Karen Nyberg and Suni Williams also provided a keynote address to conference participants. Using their experiences and stories from living aboard the orbiting laboratory, they shared three life lessons: get to the starting line and make yourself available for these kinds of opportunities, don’t forget the basics that you learned in kindergarten, and stop and enjoy the journey along the way. Williams was announced today as one of four U.S. astronauts who will be the first to train to fly on American commercial crew vehicles. The conference is bringing together leaders from industry, academia, and government for three days of detailed presentations and discussions about innovations and breakthroughs in microgravity research, life sciences, materials development technology development, human health and remote sensing. Would you teach me Spot the Station timetable, please? tune in to universe of quietness though I am on the ground .